The Riverside is a mega township over 25 acres in Neral location by Olympeo Infrastructure Ltd. A luxurious residential towers having 1 BHK, 2 BHK and 3 BHK apartments and studio apartments. The project is planned for about 1 million sq.ft. of development and over 4 acres of central open space for green and sustainable development. The value of the apartments have been estimated to be around 13 Lacs to 23 Lacs in the sizes of 415 Square feet to 1085 Square feet. Riverside in Mumbai is a residential project that features a total 900 residential apartments in 1, 2 and 3 BHK types of units in sizes of 415 to 639 sq. ft., 809 to 886 sq. ft. and 1064 to 1085 sq. ft. respectively. Currently the project is under construction and spreads across total land area of 25 acres with 80 % of open space for active living. Buying price starts from 8.7 to 13.4 lakh for 1 BHK, 17 to 18.6 lakh for 2 BHK and 22.3 to 22.8 lakhs for 3 BHK setting beautiful landscaped gardens and ample greenery. The Riverside residents are well-designed vaastu compliant apartments that meet the needs and preferences of modern day families. 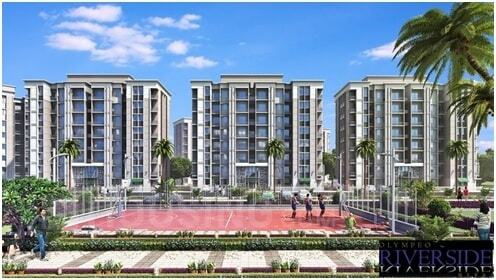 There are number of benefits of living in apartments with a good locality. The location of Olympeo Riverside makes sure that the home-seekers are choosing the right apartments for themselves. It is one of the most prestigious addresses of Mumbai with many facilities and utilities nearby Neral. Neral is a quaint town in the Raigad district of Maharashtra. The nearest airports are Navi Mumbai International Airport and Mumbai Airport. It gives easy proximity to many industries and holiday spots that has attracted a number of residents, investors and Real Estate Developers to Neral. Olympeo infrastructure's Riverside project is situated in Sanpada, Neral, Navi Mumbai, Maharashtra. Olympeo Riverside will help to lead a smooth lifestyle with all sorts of amenities such as kid's gaming zone, landscape garden, 24x7 water supply, gym, swimming pool, shuttle service,Cycling Track, Round the Clock Security, Gated Community, Shuttle Service, Football Ground, Interactive Seatingand many other amenities/facilities of modern and urban lifestyle. Schools: - Ryan International School, St. Xavier's High School, Radcliffe School, Presentation Convent School, SBOA Public School. Shopping Malls: - Seawood Grand Central Mall Or Nexus Mall, A E Trends Time Shopping Centre, Haware Centurion Mall, INOX Raghuleela Mall. Bank/ATMs: - Union Bank of India ATM, ICICI Bank ATM, Axis Bank ATM, State Bank of India ATM, Corporation Bank ATM, City Union Bank ATM. Hospitals: - NeuroGen Hospital, Raj Hospital, D. Y. Patil Hospital, Surya Hospital, Shifa Health Care, Chaitanya Hospital. Restaurants: - Barbeque Nation, Subway, Dosa Plaza, Café Coffee Day, Navaratna Restaurant, Shalimar Restaurant. Pharmacies: - Royal Medical Store, Apollo Pharmacy, Siwan Pharmacy Medical & General stores, Amit Medical Store, Siddhivinayak Medical & Chemist. Movie Theatres: - Max Movies, Fun Square Theater.